A teak deck gives your yacht a handsome and luxurious finish but it definitely also has practical benefits as well. appearance: a natural silver grey. Anti-slip; Teak is a naturally rough wood, whether wet or dry. A teak deck increases safety on board as it has a good anti-slip effect under all weather conditions. Temperature of the deck; At high outdoor temperatures, a teak deck will remain relatively cool and that is great if you’re walking around on deck bare-footed. Insulating effect; The teak deck also has a very effective insulating effect on the interior. To keep your teak deck in good condition, the following maintenance measures are recommended. Wash the teak deck once a week with ordinary fresh or salt water without cleaning agents so as to prevent pollution. Algae and mildew may start to become established in the grain structure (turning the teak deck green), which makes the structure rougher. The rougher structure makes the deck more susceptible to wear. You can prevent this by cleaning the teak deck once or twice a year. Make a soap solution consisting of 1% soft soap (otherwise known as green soap) in a bucket of warm water. Take a soft brush and scrub the deck, exerting light pressure on the brush, across the grain of the wood or make rotating movements. This is an effective way of removing the contaminants from the deck without damaging the deck. In addition to the above-mentioned maintenance, we would advise you to have your teak deck inspected at the boatyard every five years. The aim of this inspection is to check for damage to the deck and inspect the caulked seams. Caulked seams may become worn over time. It is important to replace or repair these worn caulked seams in time to prevent moisture penetrating between or below the teak deck planks. Never use a high-pressure cleaner to clean your teak deck. This appears to clean the teak deck quickly but the use of a high-pressure cleaner eats away the softer grain of the planks. This makes the grain structure much rougher, with the result that dirt becomes more easily embedded in the teak deck, causing it to wear faster and become thinner. Never use a hard brush as the use of a hard brush can also scrub away the soft grain. Never use household cleaning products other than soft soap and definitely do not use detergents. Other cleaning products contain powerful degreasers, which harm the wood and possibly the caulked seams as well. Detergents are also bad for the paintwork on board as they have a powerful degreasing effect. You should also be careful of “professional” teak cleaners. These cleaners try to restore the teak deck to its original brown colour but that does not last long. The deck returns to its silver-grey colour after a while. These cleaners are usually based on powerful chemicals. If these cleaners are not prepared properly, e.g. not diluted properly, or if the deck is not rinsed properly afterwards, this type of cleaner can damage other exterior components such as your paintwork or the aluminium sections of your windows. If you follow the above maintenance instructions, you will be able to enjoy your teak deck for many trouble-free years. The design and thickness of teak deck sections, the method of construction and the way in which the teak deck is attached to the floor are factors of essential importance in guaranteeing that you will enjoy your teak deck for years to come. 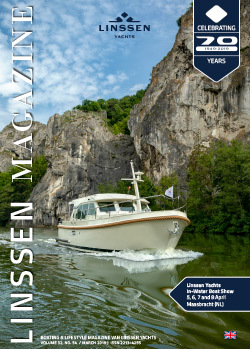 Linssen Yachts has a lot of experience in this area and, as a result, has developed a unique, high-quality teak deck construction which has definitely proved its worth over the years.